Paris in spring, you say? 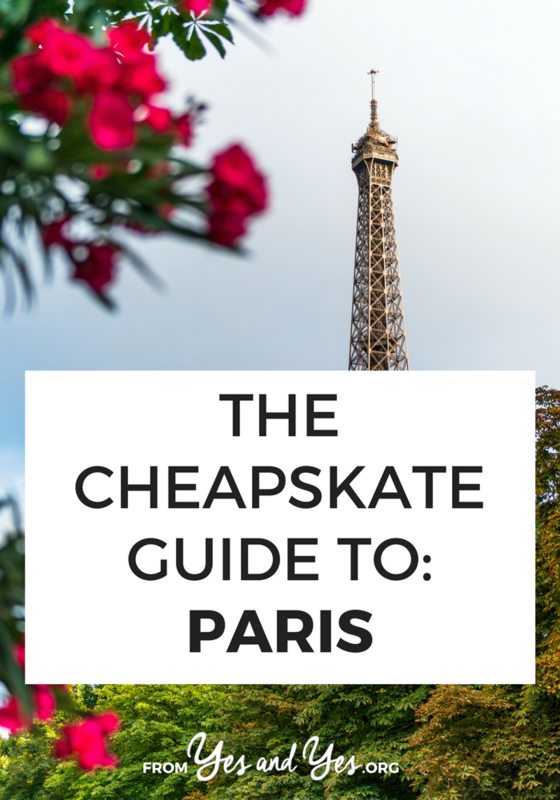 How about Paris in spring on the cheap? Today, American expat Amanda and her French boyfriend are telling us about $21 Airbnbs, three-course meals for $9.50, and tons of free museums and galleries! Hi! I’m Amanda. Last year I relocated to Paris to be with my French boyfriend. I adore living in Paris, and have had the most wonderful time delving into the French language, culture and cuisine. You can check out my blog, Gourmanderie, for my kitchen and Paris escapades! For this article, I collaborated with my boyfriend to identify things that can help you visit Paris in a way that won’t leave you broke but will give you a taste of la vie Parisienne. We hope this helps! Airbnb tends to be the cheapest year-round lodging option in Paris, as their prices don’t fluctuate as much as hostels and hotels. There are plenty of Parisians opting to rent their spare bedrooms (or lounge rooms! ), and rates start at around 20 euros per night. Bonus: you get to see what it’s like inside a Parisian home! This lodging is only 20 minutes to Paris’ center plus your own kitchen to cook in! Has access to a train and two metro lines which will definitely come in handy. A nice looking place with plenty of privacy that’s only forty minutes from Paris’ center. While it’s in the suburbs the host does mention that there is a night bus (which usually runs by the hour) after 1 am. There’s a tonne of hostels in Paris, but prices, as mentioned, can fluctuate rather dramatically. A 12-bed mixed dorm at St Christoper’s Inn Canal is about 16.50 euros a night during the week in the off season, but increases to more than 50 euros in the summer. If sharing a room with 12 people is more than you can handle, The Loft Boutique Hotel do ‘deluxe dorm’ bed from 23 euros, sharing with 5 other people, in the off season. Consider staying in one of Paris’ outer arrondissements. In outer arrondissements, such as the 13th, 14th, 18th, 19th and 20th, the lodging can sometimes be cheaper while still offering the convenience of the metro (subway) and numerous bus lines, which can take you anywhere in Paris. There are also Airbnbs and hostels in the banlieue (the suburbs) that can be notably cheaper than options in the arrondissements, but I advise you to look into the area’s public transport as you may end up spending everything you save (and more!) on catching cabs! There’s a sizable Couchsurfing community in Paris! You’ll sleep anywhere from a couch to your own bed, and you even might be able to hang out with your host, if they have the time. Of course, you can always swap homes with a Parisian! A website like HomeExchange is a good place to start. La Madeleine is a historical 900 year-old neo-classical church. 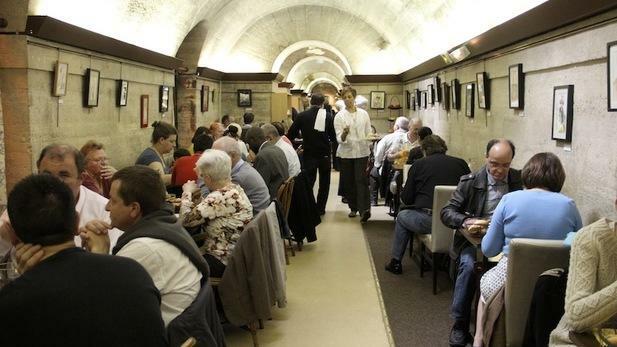 Few know that deep in its basement is a volunteer-run restaurant that serves 3-course French meals under a vaulted ceiling! Canteen-style buffet isn’t very common in France, but this is exactly what the restaurant chain, Flunch, specialises in. While Flunch doesn’t have the coolest ambiance, they do serve the best version of fast food that I’ve ever encountered and, best of all, you can order wine! Something cheap and very French that you can get at nearly any time of day is a crepe. My boyfriend and I like to sometimes grab a crepe from La Creperie at 12 Rue Soufflot, in the 5th, and then stroll over to the nearby Luxembourg Gardens to people watch while we devour our cheese, ham and mushroom crepes! Google map ‘Creperie Paris’ to find one near you! Head to a bakery and a market to prepare an easy picnic basket! Sandwiches and quiches can start from 3.50 euros (if you’re not buying in a touristic area) and you can buy all sorts of fruits, vegetables, cheeses. There’s a law that ensures that all bakeries that have the words ‘boulangerie’ or ‘boulangere’ in their shop title must make their bread on site. If the bakery doesn’t have these words in their shop name, then it’s probable that their bread is made elsewhere. Just so you know! A simple pita sandwiches can start from about 5 euros, especially if you’re happy to order to-go. Like creperies, falafel shops can be found all over Paris. There are plenty of famous falafel shops but you can always go somewhere that is lesser-known but with lots of great Google or Yelp reviews. Even some of Paris’ most famous museums, such as Musee D’Orsay and the Louvre, can be visited for free! Dozens of museums and galleries offer free entry on the first Sunday of every month – just go early as the queues can stretch on. Even cooler is that full-time students, teachers and people under the age of 26 can get free entry into plenty of museums, such as Musee national Picasso and the Chateau de Versailles, all year round! There are also lots of museums and galleries that are always free, including Maison de Victor Hugo, parts of Notre Dame and the world’s oldest botanical garden, Jardin des Plantes. Here are some others. Paris is famous for being a walkable city. A flaneur is a person who strolls, loafs and saunters around town while observing society, and this remains a respectable pastime in Paris (here’s a wonderful quote by Charles Baudelaire about the flaneur). Some beautiful places to engage in a flanerie are along the banks of The Seine, Montmartre (the home of Amelie! ), the Latin Quarter, the 5km Coulee Verte (which used to be a railroad) and the route that takes you from The Louvre, down the length of Champs Elysees and then to the Arc de Triomphe. There’s a Meetup group that does regular walking tours of all the different neighbourhoods of Paris for only five euros, and it’s a neat way to step off the beaten path and venture into more hidden aspects of Paris. There’s also tours run by the group, Discovery Walks, which are paid for by donation. Two of my favourite places to shop while I’m abroad (and in general) are at local thrift-shops and flea markets! Places to thrift shop in Paris are Ma Ressourcerie, Emmaus stores (which are like the equivalent to The Salvation Army) and Ma Petite Rockette. Here are some other thrift shops and flea markets in Paris. A great way to de-cramp after your plane journey is to head to a yoga class! Affordable Yoga in Paris do one-hour classes for 6 euros. If you don’t speak French, you’re in luck! All classes at Affordable Yoga are conducted in English. That’s it! I hope that this in-exhaustive list can help you somehow. Bon voyage and all the best for your Paris adventure! Thanks so much for sharing, Amanda! Any other expats or Parisiennes who can share their tips? These are great tips I’ll remember for a future trip. I have only been to Paris once and it was 4-5 years ago–before I started air bnb-ing everything. That will change a lot for future trips. Also, the bakery tip is huge. I had no idea…it’s also just an interesting tidbit. Thanks for sharing! Unless things have changed, free museums for under 26 is only for Europeans. I had a French student id and got in most museums in Paris but not all of them. It really depended on the ticket person! So for those planning on 100% free museums because they’re young, don’t bet on it fully. Wow, thanks for the tips! I lived in Paris for 2 years and didn’t know a few of these (the shame). Regarding free museum entry, I was an international student under 26 and didn’t have any problem whatsoever entering museums for free… I think you have to be living in France though (i.e not a full time foreign student with a student I.D). Whoa! That’s awesome – have so much fun! How fitting – I’m leaving on my first Europe trip in a couple weeks and will be heading to Paris for a couple days (solo). I AM SO EXCITED! Ahhhhh! You’re going to love it! I almost always travel solo and it is The Actual Best! Love this! I am leaving for Paris in a week and definitely will be using these tips! I wish my family was hip to the idea of Airbnb, but I just recently got them to use Uber, haha. This was a lovely post, and at the perfect time too! Yay! I hope you find it useful!